Many of us rig our own electronics, especially on relatively small, simple boats. And truth be told, there’s no great mystery when wiring up a fishfinder or a chartplotter. You have power leads, maybe a transducer cable or a NMEA 2000 wire to route, and all is well, right? Well, maybe. My son rigged a new fishfinder on his skiff last week, and made a rookie mistake that I see time and time again. See if you can pick it out, from this picture. Do you see the mistake? It’s in the process of being fixed, in this photo. Slightly to the right of center, there’s a twistie-tie holding the coil of cables together. That’s what was holding the coil when he took the fishfinder out of the box, and after running the power wire to the battery, he re-used it to keep the wires neat. I like the foresight of keeping the wires neatly coiled, but the problem is, the metal in those twistie-ties will corrode away into nothing in a matter of months. If your boat lives near the salty Gulf waters, it might not even last more than a few weeks. 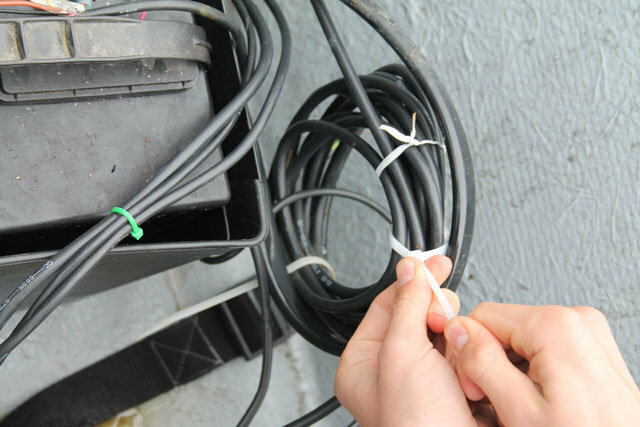 Then your boat hits a wave, the wires jiggle around, and your neat coils turn into a rat’s nest of tangled wires. Meanwhile, rust streaks from the metal stain your boat. Lovely. The fix is simple, and you can see it happening right there in the same photo. He’s putting plastic tie-wraps around the coil. And shortly after putting them in place, he removed the wire twistie-tie and threw it in the trash. The next time you put new electronics in your boat, make sure you do the same. Ditch those twisties, and use a plastic tie-wrap, instead.